Aluminum nickel cobalt magnet, also known as speaker magnet. It was generally made of internal magnetic horn. It has small power, narrow frequency range, it is hard and brittle. It sintered from magnetic material powder and iron powder at about 1200 degrees centigrade. 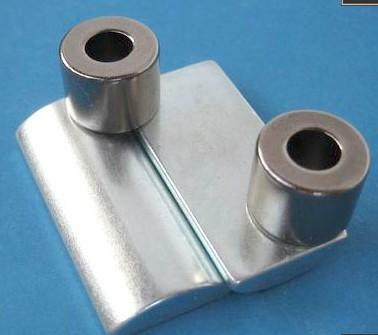 It was generally made of external magnetic horn, it is low in price, high in quality. Its disadvantages are large volume, small power, and narrow frequency range. Its performance is much better than that of iron oxide magnets. The magnetic strength of the same volume is 10 times higher than that of general iron oxide. Its characteristics: the same magnetic flux under its small size, large power, wide frequency range, HiFi headphones are basically using this kind of magnet. 1) The better the magnet material is, the greater the magnetic flux density B is, and the stronger the force acting on the sound film is. 2) The larger the magnetic flux density B is, the greater the power is, and the higher the SPL sound pressure level (sensitivity) is. Headphone Sensitivity: When pointing to the earphone and inputting 1 MW, 1 kHz sine wave, the sound pressure level (sound pressure unit is dB, the greater the sound pressure, the greater the volume), so the higher the general sensitivity is, the smaller the impedance is, the easier the earphone sounds is. 3) The larger the density of magnetic flux B is, the lower the total quality factor Q of the loudspeaker is. Q (quality) is a set of parameters of the damping factor. In TS parameters, Q values are divided into Qms, Qes, and Qts. Qms is the damping of the mechanical system, which reflects the absorption and consumption of energy in the motion of the horn components. Qes is the damping of the power system, mainly reflected in the voice coil DC resistance of the power consumption; Qts is the total damping, and the above two are related to Qts = Qms * Qes /(Qms Qes). 4) The greater the flux density B is, the better the transient is. Transients can be understood as “fast response” to signals, and Qms is relatively high. The earphone with the good transient response should respond immediately when the signal comes, and the signal stops abruptly when it stops. In particular, it is most obvious that the transition from music to Orchestra in the orchestra of drum music and larger scenes is most obvious. The quality of the magnet is one of the important factors affecting the quality of the sound. Next Next post: What are the Types of Magnets?